NOAA forecasters say there is a 70% chance of G1-class geomagnetic storms on June 27th when a stream of solar wind hits Earth’s magnetic field. The gaseous material is flowing from a large, irregular hole in the sun’s atmosphere. High latitude sky watchers should be alert for auroras, especially in the southern hemisphere where winter darkness favors visibility. 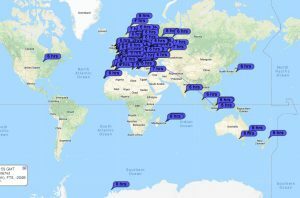 Today very bad propagation in all hf band. Bad E-sporadic in 6m and 10 meters over Italy and South Europe. Sunspots today 16 in a ragion only. In the late afternoon good propagation on 20 meters with China, Japan and Australia in SSB also. UPDATE: It’s begining now a geomagnetic storms class G1 Kp5….